What if you could whiten your teeth, improve your gum health, get rid of cavities and bad breath, possibly stop those migraine headaches and get a better night’s sleep in just three easy steps? You could do that and more with just swishing some cold, natural pressed oil around your mouth! If you think that sounds crazy, you’re not alone. When I first heard about oil pulling, I thought, “Oil can pull toxins from your mouth and make you healthier? What kind of sorcery is that?” However, the more I researched this practice, the more I have learned that oil pulling may actually be beneficial to your health. It might even be worth a try! So, what the heck is oil-pulling exactly? What is all the hype about? 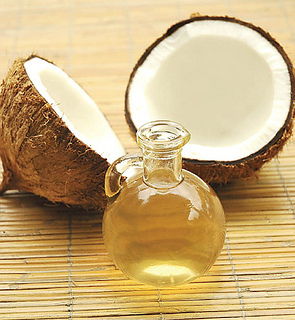 Oil pulling may seem like a new health trend, but has actually been around for hundreds of years. Also called “gandush,” it has played a key role in ancient Ayurvedic dental and clinical health. The art of oil pulling simply means swishing a tablespoon of oil in your mouth for 10-15 minutes, then spitting it out. The oil contains special agents that pull harmful bacteria, fungus and other organisms that can potentially be a threat to your health out of your mouth, teeth, gums and even your throat. How is that possible? Well, oil, by nature, is a natural emulsifier, meaning it deep cleans like dish soap would to a crusty, dirty dish. It also contains lipids that absorb toxins and pulls them out of the saliva, as well as stopping cavity-inducing bacteria for sticking to the walls of your teeth. 2. Swish a tablespoon of oil for 15-20 minutes in the morning (this may seem difficult, but if you swish while going about your daily morning routine, the time will be up before you know it). Be sure to do this on an empty stomach to make sure the oil absorbs and detoxifies as much bacteria as possible! 3. Spit in the trash can, and finish up by brushing your teeth! (Don’t spit in the sink; oil can clog up your drain). I’m no health fanatic, and I’m a bit skeptical, but I might consider trying oil-pulling myself just to see what types of benefits it can provide for my body. Maybe this technique can get rid of my annoying seasonal allergies that always seem to attack me! After all, the benefits might be too good to miss out on. Should I give oil-pulling a go? What do you think? Let me know in the comments section below!